New book by Tom Cox (free today on Amazon) tackles how to avoid paying these unnecessary fees so money can be spent on something that's more important like a kid's education or help with a new home purchase. Sacramento, CA, September 13, 2013, 11:59 am -- /EPR NETWORK/ -- According to research, "Estate Planning Attorneys would rather just write up a will for few bucks now so they can make a bundle on probate legal fees later." 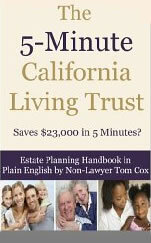 In his new book, "The 5-Minute California Living Trust" (free today on Amazon), Author & Non-Lawyer Tom Cox breaks down the legalease into plain English on how to avoid these unneeded legal fees entirely. The average person pays $23,000 in legal fees during probate. These are attorney fees that are completely unnecessary and avoidable. The 5-Minute California Living Trust shows how to avoid probate and take that $23,000 and put it into something more important, like your kids' or grandkids' college education or down payment for a new home.